(Bengaluru, Jan 27,2019):Expressing his desire to have a pre-poll alliance with the Congress in Karnataka, former Prime Minister and JD(S) National President H D Devegowda said that ?the formal talks with the Congress leaders on alliance will be held soon?. Speaking after holding a meeting of poll preparedness of Bengaluru City JD(S) MLAs, MLCs and Office bearers here on Sunday, the former Prime minister said that ?so far no formal talks was held with Congress pre-poll alliance?. Stating that JD(S) will appoint Working President to Lok Sabha seats coming under the Bengaluru Urban and Rural districts, Mr Gowda said that ?Rajya Sabha member Kupendra Reddy will be appointed as the JD(S) in-charge and will interact with the workers and the leaders in co-odrinating the election campaign?. He said that the number of seats and the Constituencies the JD(S) will get, will be known only after working out the pre-poll election pact with the Congress, Mr Gowda hinted that he may chose to contest from the Bengaluru North Lok Sabha seat, which was held by Union Minister D V Sadananda Gowda. 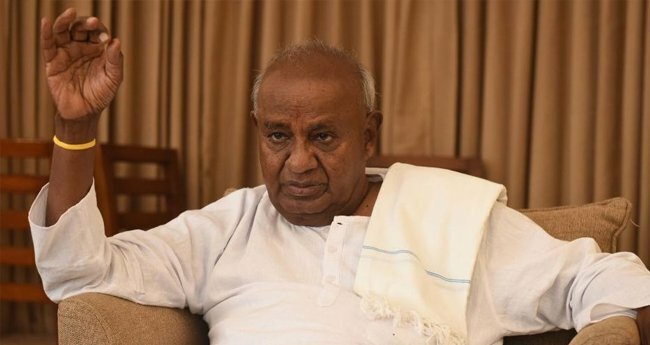 Mr Gowda has already declared Prajwal Revanna as the party''s candidate for Hassan Lok Sabha seat, which was represented by Mr Gowda himself. ?A final decision will be only taken at the JD(S) Parliamentary Board the highest decision making body of the party? he added. Referring to the achievements of the JD(S)-Congress coalition government in Karnataka he said that ?Kumaraswamy''s ''Badavara Bandhu'' scheme, intended to protect the poor people from the money-lenders have helped scores persons including farmers?.